I have been searching for a way to make Drupal output cleaner, lighter, more semantic HTML since I started theming. 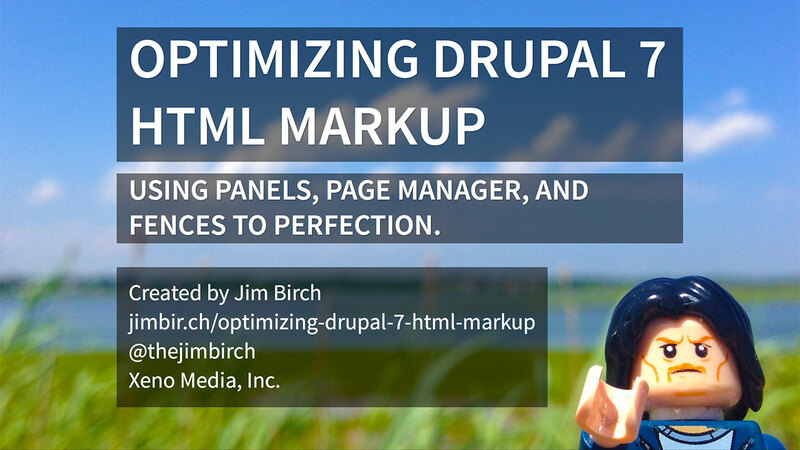 The goal of my approach here is to minimize the markup that Drupal outputs, and gain complete control over the what and the where of the markup. We can gain control of the fields using the Fences module; gain control over the templates in the theme; and gain even more control over the placement and what gets loaded using ctools' Page Manager and Panels. I will step through each of these items in detail in this presentation. Completely separate the design from the content and the layout. Minimize markup bringing better rendering and faster performance. How to find and configure Template files in your theme. After working for a decade and a half in various eCommerce CMS', I made the leap to primarily Drupal development when I became the Strategist at Xeno Media, Inc in 2012. I have been learning from the Drupal community and a multitude of clients ever since. I have presented at Twin Cities Drupal Camp, and DrupalCorn.